I just love this shower unit ! Spacious and light with more than enough room for two! The shower unit Sensmare was designed by Professor Gunter Horntrich and is one of the new lines added to the Hoesch range. The shower unit’s glass is made from patented Hoesch Everclean glass, which is resistant to both lime scale deposits and water marks forming. Great for keeping the shower looking beautifully clean and shiny with little effort. My kind of practical shower! The slatted seating and standing area are made from durable African wood. Being able to flip them up individually offers great different variations when or if you want to share your shower time! With a row of water jets located at the far side of each seat this shower is an ideal space to sit, relax and chat. In recent years showers have become sanctuaries for relaxation and de-stressing after a long day or as an instant refreshing wake up at the start of the day. 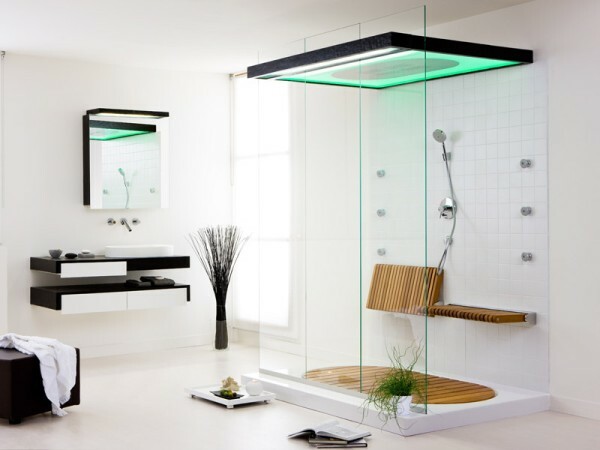 Those who prefer not to wallow in a bath will love this shower unit with its subtle coloured integral lighting. I love the unobstructed glass panels, low shower tray to step into and the generous amount of space Sensmare offers. A far cry from trying to squeeze into tiny shower cubicles of the past especially if you wanted to share your shower time! Hoesch designs are all about providing havens to promote well being and inner peace. Sensmare shower unit certainly offers those qualities for me.